I started reading US by David Nicholls (which was sad, funny, and excellently written) but something about it just wasn't doing it for me last week, despite all the good things about it. Georgie McCool and her best friend for nineteen years, Seth, are so close to getting the green light for the sitcom they have been working since college. But the producer wants to see the pilot PLUS four additional episode scripts by Christmas. This is Georgie's dream. The life goal she's been working on since... forever. But there is one problem. Georgie is supposed to go to Omaha with her husband and kids for Christmas. It's a family tradition, and quite possible one of the most important to her husband, Neal. So when Georgie breaks the news to Neal that they can't go to Omaha for Christmas, she expects his disappointment. What she didn't expect was that Neal would take the girls and go without her. Not only that, but Neal is angry. Angry about being second to the show and Seth. Just... angry. But that isn't anything that Georgie hasn't known since they were dating. Neal's the angry type, has never liked her line of work, and never liked Seth. But the love they have, the LOVE, has always been enough. Despite everything, Georgie and Neal are crazy about each other. Or at least she thought they were. Suddenly Neal isn't sure if love is enough anymore. And suddenly Neal is gone with the girls in Omaha and not answering any of her calls. Georgie is so close to her career dream, but suddenly isn't sure if it's worth it. It's got to be worth it, right? On the verge of emotional breakdown, Georgie decides she can't face her empty house and starts staying the night at her parent's place. 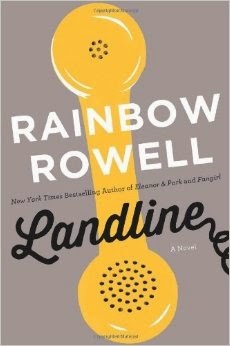 Since her cellphone battery is pretty much dead for good and Georgie can't seem to get herself to the store to buy a replacement, she digs up her old, yellow, dial tone phone from her closet and starts trying to call Neal that way. And suddenly Neal is actually answering the phone. And they are talking, for real. And Georgie is learning all sorts of things about Neal that she never knew before. Georgie realizes that this is her chance to change their marriage. I loved this story. I loved reading about how Georgie and Neal met and finally got together, then finally fell in love. It was such a realistic depiction of dating and uncertainty, then of marriage and love. Rowell's description of how a couple grows together in marriage is so good. There are several passages that will be my go-to descriptions of what love in marriage is like from now on. Landline is going to make you fall in love with your significant other all over again. I spent half the time reading this book remembering how I met and fell in love with my own husband, and all the struggles we've been through and worked through because we felt like it was worth it. There is a fantastical element to this story that is sort of bizarre, and out of nowhere, but it works. It remains unexplained, but it really drives the story and gives it that something extra that makes it stand out from many similar books like this. I liked Rowell's style of writing and I'll definitely make an effort to get her other books. I've been meaning to read her for awhile, but just never got around to it until now.